Electron System's Coil heaters are made of nickel chrome resistance wire placed inside chrome nickel steel tube filled with mgo powder and compacted for faster and efficient heat transfer. The heaters are annealed to acquire malleability for bending into any shape. Hot runner heaters with built in thermo couple are also available. Hot runner bushes are produced with hot runner heaters of different cross section with inner brass and outer stainless steel cover. We are one among the reputed coil heater manufacturers in Bangalore. Nozzle heaters are hermetically sealed for liquid plastic during the manufacturing process. The connection between the heating element and the leads is protected by a special fitting made of brass/stainless steel 1 mm thick, without welding which allows a high mechanical strength in the most delicate area of the heater. » Nozzles of Injection molding machines. » Other cylinder heating applications. » All Plastic & Rubber Processing Machinery. » Contributes to faster heat-up and throughput for increased productivity. » Gives an almost instant response to temperature control. » Resists contamination by overflow of plastic or other free-flowing materials. » Eliminates cumbersome clamping straps, making installation easier. Electrons Micro Tubular Heaters are manufactured in round, square or rectangular section to guarantee the greatest thermal exchange keeping an excellent efficiency and a good reliability. 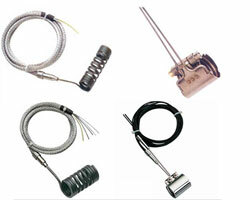 These heaters can be manufactured with built in thermocouple J or K type. Construction : The resistive wire is uniformly distributed in a compacted MgO insulation, with a CrNi-steel outer protection sheath. » For heating the nozzles of Injection Molding Machines. » Thin Walled Container Moulds. 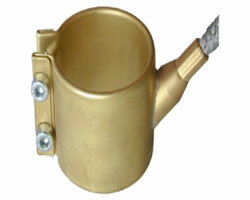 » Hot Runner Nozzles & Bushings. A very wide contact surface results in exceptionally high levels of thermal conductivity towards the body that needs to be heated. Optimal insulation results in very long life duration. 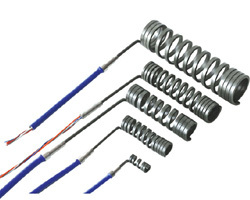 Heavy-duty construction results in very high resistance to mechanical shocks.